The emphasis of the Prova briefing was on “tasting food” containing the Prova aromatic palette. “Visitors must have easy access, feel attracted and inspired by all the food preparation and most of all feel free to grab a bite”; taking existing images and house style directives into account. 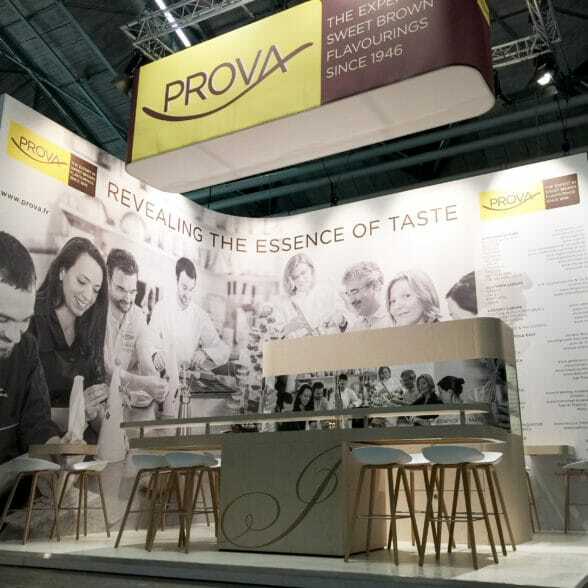 For the Natural Ingredients Europe 2014 tradeshow in Amsterdam we have developed the Prova brand experience concept in cooperation with advertising agency “Effort” (messages and graphics). Our challenge was to create an open, accessible and in size flexible brand experience concept. Reference is made to the customer briefing: “Easy accessible with key focus on tasting food products prepared with the Prova aromatic palette”. 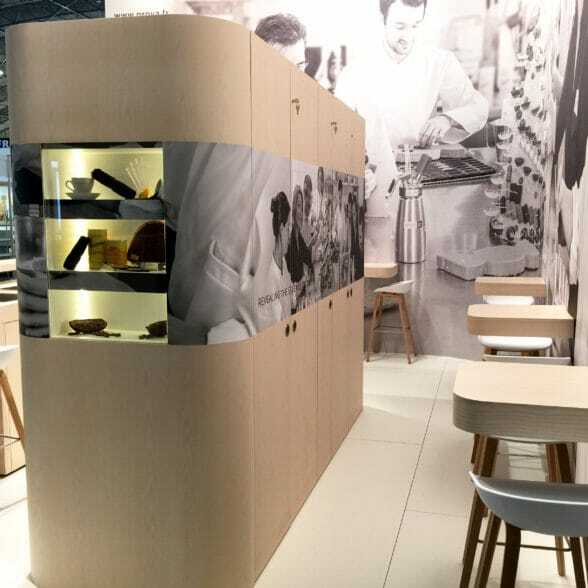 Clients and prospects were invited to be seated either on the cooking unit or on the small tables positioned against the high communication wall. At the Paris Food Ingredients Europe 2015 the floor space was 60 m2. Again in cooperation with advertising agency Effort we implemented the new Prova campaign into the brand experience. A circular lighting shade was positioned centrally communicating the coming anniversary of Prova and covering the central hospitality area. The cooking unit was positioned against the corporate wall.